New introductions to Waterworks expanding kitchen collection of fixtures, fittings and accessories. Dedicated as it’s been for 30 years to innovation and quality, it isn’t surprising that Waterworks’ latest introductions to its expanding kitchen category are as gorgeous as they are functional. In addition to great faucets and hardware, its newest sinks, mixers, floor and wall surfaces, and accessories now extend the high-quality design, craftsmanship and service Waterworks is known for to a new level. “The kitchen is a reflection of one’s most personal routines and rituals,” explains Barbara Sallick, Waterworks co-founder and creative senior VP of Waterworks. 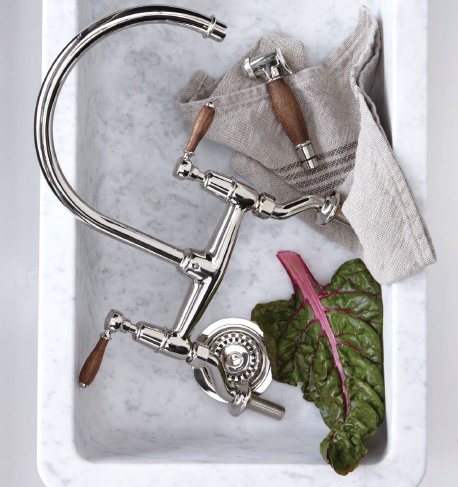 And the company’s new offerings include additions to the popular Julia and Henry Kitchen collections, as well as the ceramic vegetable bar sink, soapstone utility sink, the square wood bar sink ( you have to see this beauty in person), and the concrete farmhouse bar sink. Waterworks also added new introductions to its accessories collections. Standouts include apothecary selections infused with olive oil, mint, and sage to generously-sized, linen towels. If you plan to renovate your kitchen like I recently did, you owe it to yourself to visit a Waterworks showroom before you get started. To find one near you, click here.